Tufel Media Digital Marketing focuses on LISTENING! It is crucial for businesses to use social media properly. One of the most important aspects of social media, that many businesses fail at, is LISTENING. Listening gives you a competitive advantage. Tufel Media can LISTEN for you. How? By creating lists with hashtags that are used by consumers in your industry. We do searches by keywords and listen to the conversations that consumers are having about your brand. Engage them the way they engage each other. In order to engage consumers in the same way they engage each other, a business has to LISTEN. Reading long threads of posts is a time consuming task. That’s why Tufel Media takes the time to do this for you. Hiring us is like having a public relations team for the fraction of what it would cost to hire as many employees. Our team focuses on engagement, but before we engage, we listen. Imagine a group of consumers are talking to one another about a specific need. One company who can very easily fulfill that need but has no idea that these conversations are even going on. The other company IS listening, and is able to make the proper preparations to fulfill the consumers’ need. That other company is you! With Tufel Media’s help, you can leave your competitors in the dust! 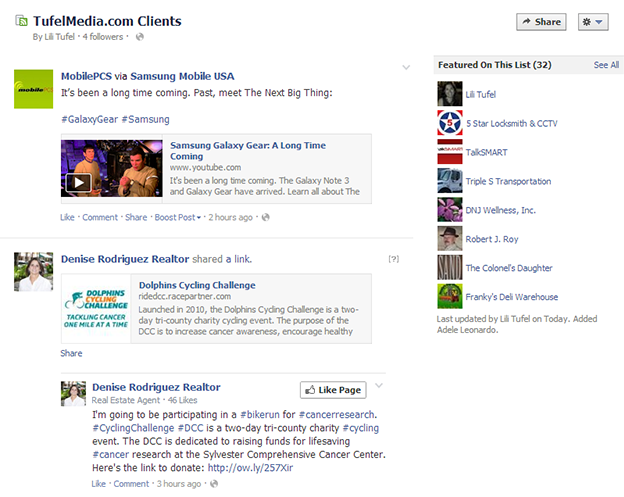 A News Feed provides Facebook users with frequently updated content from their friends or page’s they’ve liked. Your news feed can found on your home page. When users have a lot of friends and have also liked a lot of pages, the news feed can get jam-packed with frequently updating information. This can be too much for a lot of people to handle. When using Facebook as a consumer, you can create lists that include your close friends and family as well as a variety of lists for a better user experience. Tufel Media can help configure your lists as well as your settings while managing your personal profile and business Page. What do our Lists look like?